Waxed damp-proof sash cord or rot-resistant man-made fibre cord 25mm clout nails Oval brads. On a sash window, the sash cord and timber sashes need regular maintenance and care to keep the window in good working order. If a cord breaks and some of the other cords show signs of wear, it is advisable to replace all the cords. Remove the curtains and clear a large area around the window for you to work in. Assemble all the necessary tools and materials. Lower both sashes to the bot­tom of the box frame. To remove the sashes from the frame you need to remove the beads holding the sashes in position. Do this with care as you will need to use them again later. 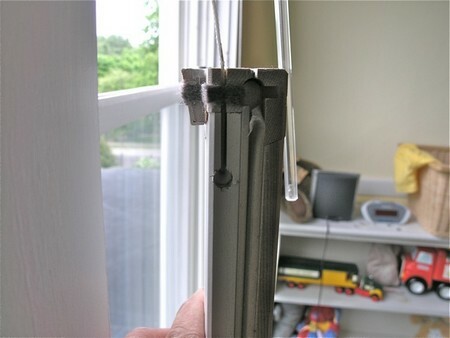 First remove the staff bead this runs up the jambs of the window and across the head. It is held in position either with pins or with nails and can be levered away from the jamb with a broad chisel. Start levering the bead in the middle of its length. When the beads have been removed, the inner sash is held in position by its own weight and by the sash cords. Lean the top of the sash away from the frame and carefully cut the cords with a knife. Keep hold of each cord as you cut it and gently lower the weight to the bottom of the box frame. When both cords have been cut, the sash can be removed. Tie a length of string to the cords. A pair of beads called parting beads lie between the two sashes to keep them apart. These will have to be removed to take out the outer sash. Again do this carefully by levering them out of their grooves with a broad chisel. Slarl at one end of the bead and work towards the other end. Cut the cords and remove the outer sash as before. You can get access to the weights inside the box frame through a small pocket at the bottom of the pulley stiles. A small wooden cover is let into the timber form­ing the pulley stiles. To remove this cover, undo the small screw holding it in place and carefully lever the cover out. To remove the weights, carefully raise them inside the box frame and draw them out bottom end first. The two weights in each side should be separated by a thin strip of timber called a wagtail. Do not try to remove it or damage it you can get at the weights by moving the wagtail aside. The wagtail keeps the two weights apart and so prevents them bang­ing into each other when the sashes are moved up and down. Mark out the lengths of cord needed. Do this carefully as cord is expensive and waste should be avoided. 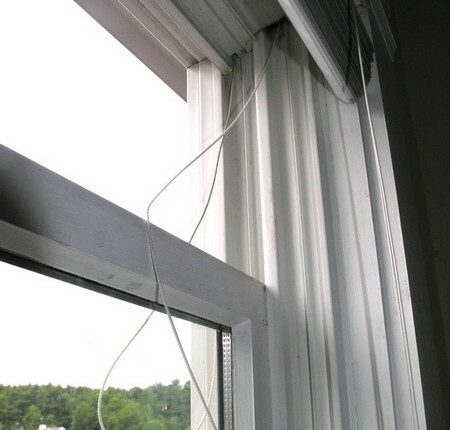 For the window to work properly the lengths of cord should be such that, when the sash is in the lowered position, the weight should be at the top of the box frame and when the sash is in the raised position the weight should not quite rest on the bot­tom of the box. The sash cord will need to be fixed on to the sash below the centre of the pulley for approximately 100mm. Mark this distance down from the top of each sash and square it across the edge. Measure the distance from the bottom of the sash to the cord line and mark this measurement up from the sill on each jamb. This line on the jamb is the lowest point that the end of the sash cord on the sash stile will reach. The two sashes may be different sizes, so care must be taken to ensure the correct measurement is marked for each sash. The next step is to insert the sash cord through the pulleys and pockets. Where the old sash cord is still there, you can use the siring. But if it is missing, you need a ‘long-tailed mouse’ a small bent piece of lead fastened to a long piece of string. Insert the mouse over the pulley and allow it to fall to the bottom of the pocket. Tie the sash cord to the end of the string and pull the siring and cord through the pulley. The weight can now be tied to the cord. The weight will go back easier if you pull on the cord a little. Now you can cut the cord to length. Pull the weight up as far as it will go to the pulley and hold it in this position. Cut the sash cord off at the length line marked across the jamb. Tie a figure of eight knot in the end of the cord and lower the weight. The knot will prevent the cord slipping back through the pul­ley. Repeat the operation on the remain­ing weights. (The outer weights should be inserted into the frame first.) Replace the pockets and screw them in position. While the window is stripped down, it is advisable to sand oil’ the paintwork and repaint the frame and sashes this is a difficult and very often unsuccessful job when the window is assembled. Ex­amine the sashes to see if their joints are sound. Replace the sashes in the frame starting with the outer one. Pull down the sash cord and nail it into the sash cord groove on the edge of the sash. The end of the cord should be nailed on the length line marked on the edge of the sash. Use clout nails their large heads give a secure fix­ing. When both sides of the sash have been fixed to the cord, place it in its proper position and check that it can rise to the top of the frame. Replace the parting beads – if they are damaged they should be replaced with new ones and refit the inside sash. Replace the staff bead – use oval brads to nail it in position. Again renew it if it is damaged. Check that both sashes rise and lower without any difficulty. 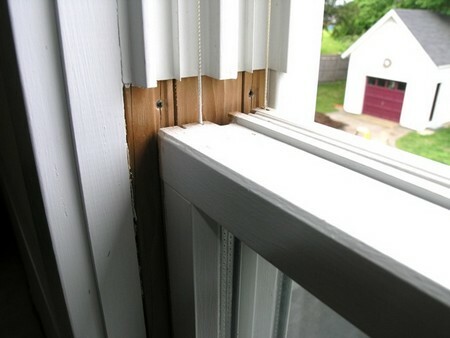 Sashes may develop loose joints when they get old. particularly if they are gummed up with paint and stick in the frame. A sash in this condition is not only awkward to operate easily, it can also be dan­gerous. Loose joints can be fixed in one of two ways cither by refastening the tenon in the mortise, or by attaching a metal plate to the side of the sash to strengthen and stiffen the joint. To relix (he joint you will have to remove the sash from the frame. Hold the sash in suitably sized sash cramps and bore two holes through the tenons that are loose. Next bore two holes down the tenons, making sure that the holes pene­trate well into the rail. Glue pieces of dowel into the holes (5mm dowel should be satisfactory) and use a water-proof adhesive. The dowels will go into holes bored through the tenons more easily if they are tapered al one end. You will have difficulty forcing tightly fitting dowels into the blind holes down the tenons unless the dowels have grooves cut along their lengths. When the glue has dried, the sash can be removed from the cramps and the dowels cleaned off ready for the sash to be replaced in the frame. The second method is to screw a metal plate on to the face of the sash. This is less successful and looks ugly, but it can be achieved without the sash being removed from the frame. To clamp the joint, it is necessary to insert two hard­wood wedges between the edge of the sash and the frame. The metal plate can then be screwed in position and the wedges removed. If the angle plate is bright steel, give it protective coats of paint to stop it corroding.